November 14, 2018. Yokohama, Japan – His Holiness the Dalai Lama arrived at the teaching venue early this morning and when he walked onto the stage the hall was still filling. He fondly greeted old friends among the monks gathered around the throne before taking his own seat. 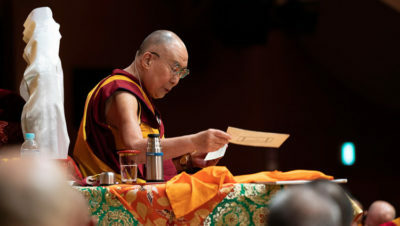 He encouraged those reciting the ‘Heart Sutra’ in Japanese to begin and when they had finished addressed the capacity crowd of 5000—Japanese, Taiwanese, Koreans, Mongolians, Russians and Chinese from across East Asia. “Here I am once again in Japan, happy to be among old friends and so many people from other countries too—I greet you all. You’ve not come here just for fun, but to listen to Buddhist teachings. This 21st century is a time of great technical development when people talk about creating artificial intelligence. I imagine they can create devices that emulate sensory consciousness, but they’re a long way from reproducing mental consciousness. Still, this is a time when we might ask if religion is still relevant. “Material development and physical comfort alone don’t relieve unhappiness, but if you are relaxed and have peace of mind, whatever goes on around you, won’t upset you. It isn’t the sophistication of the devices we own that brings us peace of mind, it’s human qualities like love and compassion. These qualities, along with tolerance, contentment and self-discipline, are what all religions teach about; therefore we still need religion today. Our different traditions may take different philosophical positions, but they are all directed towards cultivating love and compassion. Of my many Hindu, Jain, Muslim, Jewish, Christian, Sikh, as well as Buddhist friends, who are sincere followers of their own traditions, what they all have in common is warm-heartedness. Therefore, I am committed to promoting inter-religious harmony. Reminding his audience that things don’t exist the way they appear, His Holiness presented a challenge: “Look at me—what you see is my body, listen to me and what you hear is my voice, but where is the Dalai Lama. In the ‘Heart Sutra’ we read ‘form is empty’. Nagarjuna says, ‘There does not exist anything that is not dependently arisen. Therefore there does not exist anything that is not empty.’ The appearance of things does away with the extreme of eternalism; seeing things as empty eliminates nihilism. Form is empty and emptiness is form because form is dependently arisen. Form and its emptiness are of the same nature. “Aryadeva’s advice to overcome unwholesome deeds, to eliminate views of self and finally to eradicate all wrong views,” His Holiness observed, “also refers to making progress on the path. With regard to overcoming unwholesome deeds, the key to achieving a good rebirth and the opportunity to continue to practise, Nagarjuna’s ‘Precious Garland’ lists sixteen causes. “There are thirteen activities to be stopped. Of the ten unwholesome deeds to be avoided, three are physical – killing, stealing and adultery; four are verbal – false, divisive, harsh, and senseless speech; and three are mental – covetousness, harmful intent, and wrong views. Three additional activities to be restrained include drunkenness, wrong livelihood and doing harm. 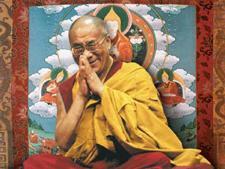 There are three further activities to be adopted – respectful giving, honouring the honourable, and love.